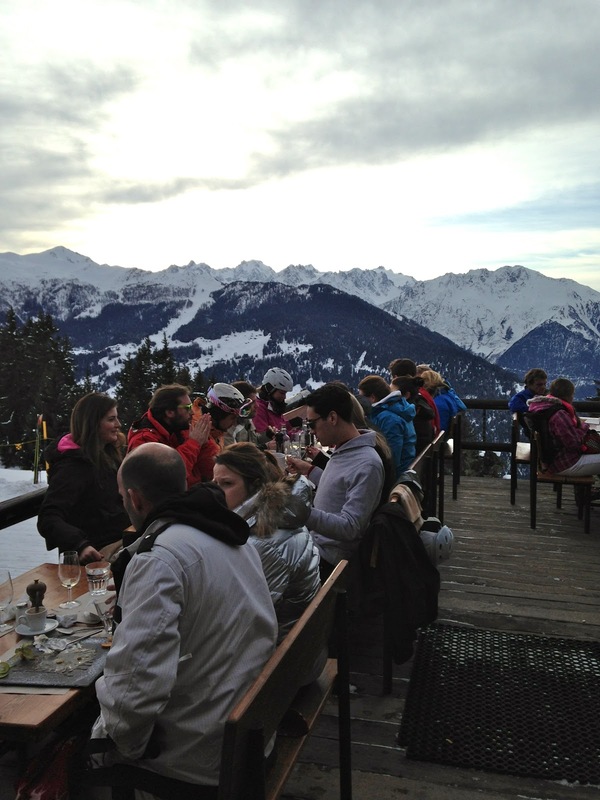 Day two in Verbier entailed a forty five minute vertical hike up the mountain for lunch. We thought this would be good exercise in lieu of paying for a lift pass just to go to a restaurant. Not sure if it was the altitude or my lack of cardio fitness, but it was touch and go there for a minute and I started pondering if I would make it to the top before collapsing. Luckily, I arrived still breathing. We got an outdoor table in the sunshine at Chez Dany (Chemin de Clambin, 1936), which is a ski in - ski out restaurant on the slopes at an altitude of about 6,000ft and with a stunning view of the valley below. Chez Dany serves typical Swiss mountain food, including cheese fondue (and a lot of dishes based on cheese), various meats, salads and pastas. After resting and refueling at Chez Dany, we started the trek back down the mountain. The descent was so much easier than the grueling climb! We stopped at Le Rouge for some apres ski drinks. This is another hopping spot where skiers descend from about 4pm in the afternoon onwards. They also grill sausages and make fresh crepes outside in this party atmosphere. We ended the evening by dancing again at both Farinet and then onto the Farm Club (see previous post). But by 2am, all of that hiking and fresh mountain air had us longing to collapse into bed.